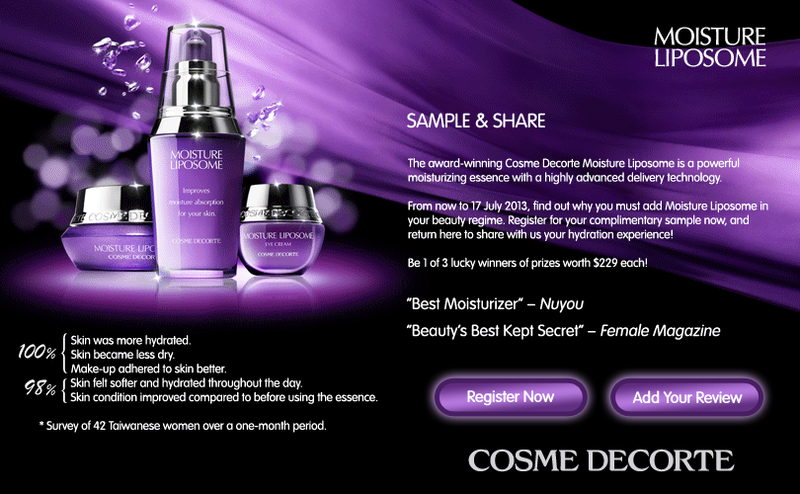 Singapore Freebies: Cosme Decorte: Register for Free Moisture Liposome Samples!! 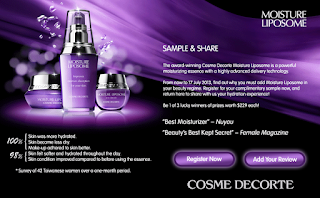 Cosme Decorte: Register for Free Moisture Liposome Samples!! find out why you must add Moisture Liposome in your beauty regime. MOISTURE LIPOSOME, launched in 1992, is a new type of cosmetic serum that incorporates liposome technology which had not until then been used in cosmetic products. Propelled by its proven benefits, MOISTURE LIPOSOME enjoys a strong customer base and robust sales, with three million bottles sold to date.